Register .ASIA Domain Name Today! .asia is a sponsored top-level domain sponsored by the DotAsia Organization, with the back-end registry operated by Afilias. It was approved by ICANN on 19 October 2006 as a sponsored TLD. It serves as a regional domain for companies, organisations, and individuals based in the region of Asia, Australia, and the Pacific. Registering a .ASIA domain name is an excellent way of getting your business noticed in the Asia-Pacific region of the world. With more and more people in Asia accessing the Internet, this is a great place to start building your business! Why should I register a .ASIA domain name? 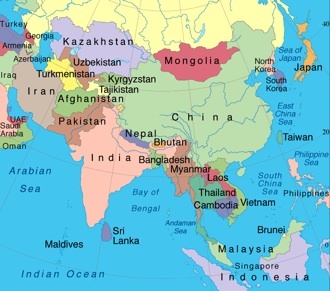 Asia currently holds 60% of the world's population, and encompasses over 90 different languages. This part of the world is facing tremendous economic and technological growth. The culture and languages throughout the Asia-Pacific region are extremely diverse. However, the people tend to find pride and common interest in the term 'Asia'. Holding a .ASIA domain helps show your company's global citizenship and desire to expand into the countries encompassed in Asia. By registering a .asia domain name, your company can provide relevant and localised information about your product and services. When multi-nationals establish presence in the region, they need a regional identity instead of simply a local one. Having a .ASIA domain encompasses all Asian countries, not just one. If you are looking to grow your business in China, Japan, Vietnam etc, registering a .ASIA could be the best plan. To register a .ASIA domain, you or your company must meet the Charter Eligibility Requirement. To meet these requirements, at least one domain contact (Registrant, Administrative, Technical, or Billing) associated with the domain name must be a legal entity in the DotAsia Community.